And they don't cost that much... Monet. 1. A heat-changing mug that reveals the human form in all its glory. Hot liquid slowly disrobes these 13 famous works of art. Get it from Unemployed Philosophers Guild for $13.95. 2. Feetaso socks that are inspired by the Toebism art movement. Currently hanging in the Toete Modern. Get them from ChattyFeet for $9.30. 3. A Venus de Wino bottle stopper that uses the goddess of love to protect your favorite beverage. Get it from Francesca's for $10 or Elphie Elora: Purveyor of Fine Goods for $10. 4. A Salvador Dali watch that is so cool, it's surreal. His mustache rotates to mark the minutes/hours while an ant marks the seconds. Get it from Unemployed Philosopher's Guide for $42.95. 5. Frida Kahlo sticky notes that are way better than your average Post-it pad. 6. A pillow cover inspired by the infamous painting "Girl With the Hubba Bubba Gum." Get it from Cabinet of Pretty Things on Etsy for $39.99. 7. A hoodie that you'll never want to let Gogh of. Featuring the original master of the selfie. Get it from BootsTees on Etsy for $34.95. 8. 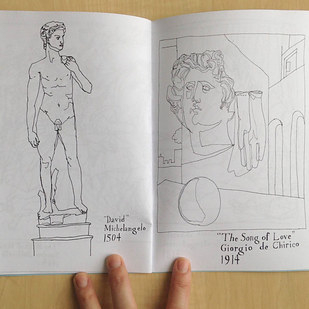 A coloring book that lets you re-create your favorite works of art. Get it from Maddiestratton on Etsy for $15. 9. An art print that shows Alice admiring the work of Jackson Pollock. Get it from ForgottenPages on Etsy for $8. 10. A computer decal that resembles the infamous "Son of Mac" painting. Or Son Of Man. Whichever you prefer. 11. 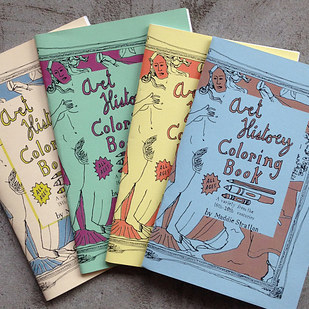 A book that details prominent works of art, as well as the historical context behind them. Get it from Amazon for $40. 12. 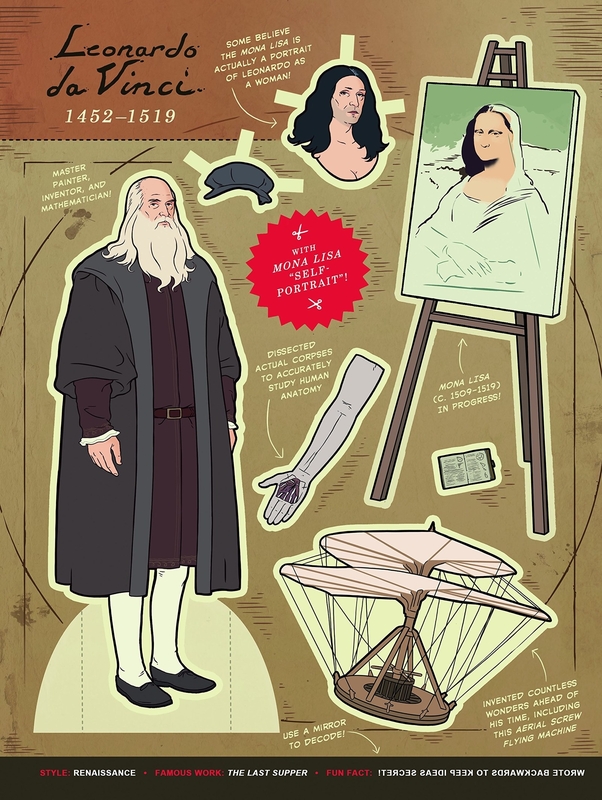 A catapult kit that lets you follow in the footsteps of da Vinci himself. Get it from Amazon for $21.58. 13. A clock that will let you ~Remembrant~ important art history moments in chronological order. Get it from MoMA for $48. 14. A pop-art poster of the Notorious RGB that Andy Warhol would approve of. Get it from Look Human for $18.99. 15. A book that reveals conversations between Jeff Koons and art curator Sir Norman Rosenthal. 16. A phone case that will inspire you to create a self-portrait. A selfie, if you will. Get it from Society6 for $28. 17. A T-shirt of Clawed Monet, famous for works such as "Meowquet of Sunflowers" and "Catnip on the Grass." Currently on exhibit at the Louvre. Get it from Look Human for $19.99. 18. Art history lollipops that you may feel too guilty to eat. "So what are you doing?" "Oh nothing, just eating Mona Lisa." Get them from LIQNYC on Etsy for $15.50. 19. A heat-changing mug that likes to play a disappEARing act. 20. Shot glasses that show "The Creation of Adam," or whatever the name of your alter ego may be. Get this set of two from Fantasticum on Etsy for $11.60. 21. Retirements that provide a ~minty fresh~ take on "American Gothic." "Goodbye, tension — hello, pension!" Get them from Unemployed Philosophers Guild for $3. 22. Socks for feet that are in desperate need of intellectual stimulation. Get this set of six pairs on Amazon for $49.99. 23. 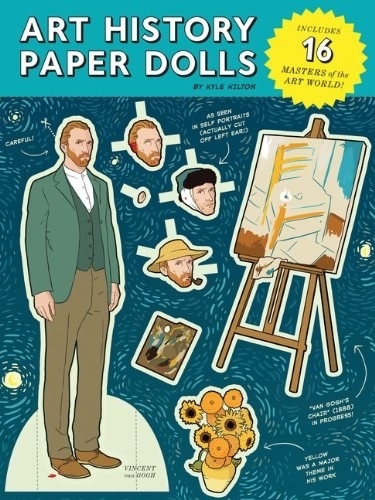 A book that contains the paper doll forms of renowned artists. Dolls include Henri Matisse, Leonardo da Vinci, Jackson Pollock, and others. Get it from Amazon for $11.65. 24. A 2017 calendar inspired by "The Great Wave Off Kanagawa." Get it from QuantumPrints on Etsy for $8.98. 25. A shirt that increases the mystery behind the already mysterious "Mona Lisa." Who shouldn't I trust? Why? Why don't you have eyebrows? Get it from MvpTshirt on Etsy for $9.95. 26. Wood art for the person who loves art history but is also obsessed with pugs. Pug With The Pearl Earring is actually my favorite piece of art. Get it from The Pastel Pug on Etsy for $50. 27. A candle that smells like "The Garden of Earthly Delights" and Bosch's studio. Get it from Werther & Gray on Etsy for $18. You, realizing you need everything on this list.